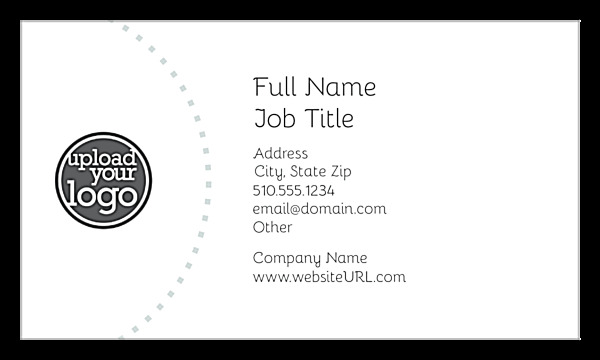 Use our Circles in the Orchard business card design template to give your brand the roots it needs to blossom into a household name. Circles in the Orchard is customizable and features a fun-yet-elegant pear background pattern available in three different colors: blue, light blue, and light purple. 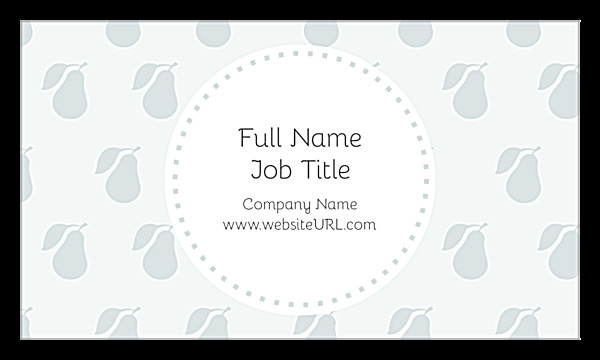 This template is a good choice for any food-related business as well as any brand that incorporates the words “fruit” or “pear” into its name. Personalize Circles in the Orchard to sow the seeds of success with business card printing that uniquely expresses your brand. Want to personalize your business card? PsPrint’s online design tool makes it easy to print custom business cards – no designer needed! Simply choose one of four available trim options and your color, then upload your logo and add your company name, your name, title, website, phone, email, and more. Use our point-and-click design tool to customize your text and even select your fonts until you’re thrilled with your design, then select your printing options – it’s that easy! You can even make a downloadable PDF to share before you print. A professional business card design needs professional business card printing, which is why PsPrint offers premium-quality paper stocks and attractive finishing options that help your brand get noticed. All our work is backed by our customer satisfaction guarantee, so you can be confident knowing you’ve made the right choice for printing your business cards. Use our business card design tool to give your brand the custom image it deserves today.